I was sitting in the Hemp House a couple years ago drinking beers with my old college buddy Skip (who teaches English here in Chengdu) and Guoguo (the owner of the Hemp House) when local rocker and all around fun guy to be around Ran Wei showed up. He told us that Anton the Russian was coming back from Cyprus for a visit. I was pretty surprised to hear that, seeing as he had a steady job out there and I remember him telling me about his three week vacations. That stuck with me, but I never really understood it until I spent some time in Shanghai. People just don’t eat right out in Shanghai. The Chinese restaurants I went to didn’t know how to slice their veggies properly, the sauces didn’t flow together and wherever I went, the noodles tasted like cardboard. So I had to book a ticket on the new bullet train back to Chengdu and get a proper meal under my belt. My main task was to reunite with the dishes that I took for granted during the 8+ years that I called Chengdu my base. All sorts of Sichuan noodles, especially Yibin Ran Mian; Hong You Dumplings; Sichuan Style Sausage; Yu’er Ji and other Mala Hot Pot favorites likes Tang Shui Frog and Shui Zhu Beef … man the list goes on and on and includes such stand-bys as Yu Xiang Eggplant, Gong Bao Chicken and Mapo Tofu. So they do what comes natural and open up a restaurant. A case in point is the Lucky Strike in Portland. They opened up there just before I left the city to return to Chengdu. A young couple from Chengdu, real open minded, the types of people you might find at the Hemp House chilling with Anton and Guo Guo. They opened up, served the real deal Sichuan Style stuff and now their business is booming. And most importantly, the Lucky Strike is a community joint. That’s how it is in Sichuan. Buffet style Chinese spots never knew that. People have been saying for years that “No one can handle the Sichuan Spice.” That’s baloney. It’s not even the spice that makes the cuisine so special, its the poppy shells. Sichuan People Love Their Food. it’s just that simple. They care about how the eggplant and the garlic and the Fish Flavor Sauce melt together. They care about presentation. They chop their veggies properly, uniformly — not random hacking. They take the time to mix and match flavors and ingredients because cooking is Alchemy. Alchemists are like Warlocks, which means it’s all mystic and magic. So without a food-loving Soul and some alchemy, your food will be tasteless, uninspiring and ultimately a destructive force of Evil in the world. If you think that I’m going overboard, then book a ticket out to Sichuan. You’ll be a slave forever, just like me. I’m not the only one. The Ya Jian Bang (???) was a local Chengdu band that sang exclusively about living in Chengdu. In this video below, they sing about all the little places around Chengdu that serve up cheap local dishes. That video is great, the lyrics are hilarious. I have a real hard time following but the interlude at 2:00 is exactly what you hear in every restaurant. Crazy how accurate that is. Kafe told me about 牙尖帮 after I mentioned it to him. How’d you discover them? actually dude, the first day i met bean she was singing the Mai Cai Ge, which got me cracking up and that’s how i first heard about them. Yeah, I didn’t realize this, but when I was watching this video last night my buddy came over and asked what I was watching. He says it’s a famous song, but I haven’t heard it before or know where it’s from. Great post! I have definitely been eating well in Chengdu – LOVE the food. Just wish I could order more of it. Lots of dishes are translated and explained in that post by Reed! I used it for weeks trying out new dishes. As soon as I read this I ran out and got some ran mian for lunch. Needless to say my mouth is still burning! This is a great piece articulating the institution that is Chuan Cai. I contest anyone who posits that China is a secular state when in fact it is clear that the country worships at the the alter of the dinner table. If food is the religion of China, then eating is the holiest of sacraments and Chengdu is undoubtedly China’s Jerusalem. Well put. 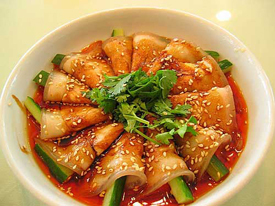 Sichuan (and Chengdu especially) put particular emphasis on cuisine. It’s why you never find a bad restaurant inside the city proper – bad restaurants just cannot hang when expectations are so high. You really begin to appreciate it when you travel to other places in China and see that people don’t put as much effort into making well-seasoned, high quality dishes. *raises hand* Hi my name is Elias and I too am a 川菜 addict. @Sascha I can relate with your gripes about the food in Shanghai. When I was working at the Expo I’d eat 兰州 noodles at least every other day because they had their homemade lajiao paste. I got my “la” on this morning, its great to be back. 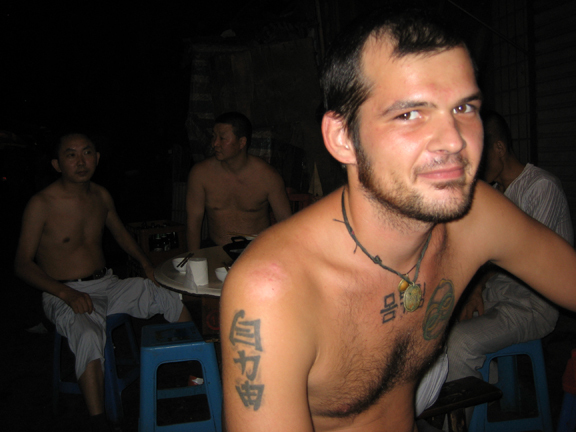 just discovered your great blog when searching for Chengdu and restaurants. I live in Tokyo and have tested many Sichuan restaurants here, and while they are not bad (as far as I can judge), I really want to try the real thing. Maybe I can make it to Chengdu soon. I really hope to. I know this comment is way late, but I think the dish you are talking about is 辣子鸡, which basically translates into pepper chicken. But its small pieces of chicken and bone stir fried with mad mad mad peppers and there are always twice as many peppers as chicken. here they also let it burn a bit, what they do is have a super hot wok and throw the peppers in to get that smoked out pepper taste, then they toss the already been seared chicken pieces in and toss with some huajiao and other stuff. Excellent taste, but I find the lack of actual edibles unsatisfying. Best to order it along with a hearty dish .. or just eat mad rice. I booked a ticket to Chengdu specifically for the food! 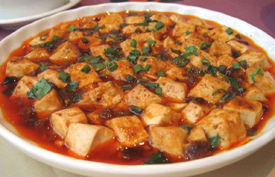 I love Chinese food, and I particularly love Sichuan food. There is a restaurant I go to here in Yokohama where I live, run by a couple from Sichuan, and I love their food. But I need to go to the source so I know the real thing! I can’t wait. You will love it. The Sichuan food here is fantastic. I’m actually surprised at how few expats come to Chengdu for food specifically, considering how note-worthy it is here.